Product Description: The new Hemi engine has rekindled performance enthusiasts' love affair with Mopar's legendary hemispherical-headed V-8. 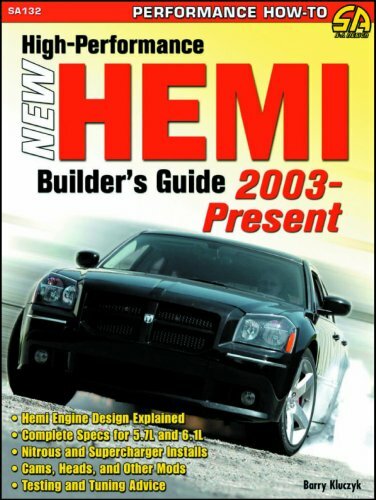 Introduced in 2003, the new, high-tech Hemi has taken the fight to Ford and Chevy, sparking a new era of high-stakes competition among domestic V-8, rear-drive cars and trucks. Chrysler's hot-selling Hemi-powered vehicles include the 300C, Charger, and Magnum, Ram trucks, as well as the Durango, Grand Cherokee and other SUVs. Special high-performance SRT models have added another level of performance to Chrysler's Hemi lineup. And the Hemi is only going to get hotter with the highly anticipated 2008 introduction of the Dodge Challenger.